1. FIRST IS THE TEI VERSION! The first kit provides the opportunity to replicate the "Tei" & "Hei/Tei Tai-Atari" aircraft! Japanese-aircraft fans can enjoy choosing the equipment & recreating the airplane! 2. ABOVE ALL, THIS FORM!! The shape of the aircraft, outlined in beautiful curves, is faithfully reproduced!! The nose, canopy area, and twisted-like surface of the fuselage, is a true masterpiece! 3. BASED OFF OF THOROUGH RESEARCH AT THE SMITHSONIAN OF THE SOLE REMAINING ACTUAL AIRPLANE!! Through assembly, you can study the method of suspension of the upward-aimed Ho-5 cannon and the mechanism behind its ammunition supply and discharge! Within the cockpit of the tragically misfortunate two-seat fighter "Toryu"
The pilot seats in the Toryu had to be placed far apart due the placement of the internal fuel tank and the necessity for loading operation of the machine cannon on underside fuselage. It is thought that this separation caused difficulty in communication between the pilots. The tasks of operating the various armaments were divided between the two. The front pilot controlled the armaments mounted on the nose and fuselage underside as well as the upward-facing cannons. The rear pilot controlled the rear machine gun. This kit allows the replication of the "Tai-Atari" (full-body ramming) version, with the rear seat armaments removed and rear pilot seat covered. However, it is said that some Tai-Atari attacks were actually carried out with two pilots. Perhaps this is because they had always battled together as a pair, facing life and death "together as one." We hope that you will think deeply about this as you assemble the kit. This SWS kit includes a detailed replication of the Mitsubishi Ha102 air-cooled 14-cylinder two-row radial aircraft engines and their elaborate nacelle internal structure. Known as "Zuisei" ("Holy Star"), Ha102 was used in many Navy aircraft. The double intake on the nacelle undersides, the opening in the nacelle side which is thought to have been part of the cooling mechanism, the thrust-type single exhaust pipe engine which was used starting from the Tei version—all the finest details included. From deducing the airflow from the internal engineering of the nacelles, the cooling mechanism was extrapolated. The three-blade hydraulic constant-speed metal propellers manufactured by Sumitomo/Hamilton were 2.95 meters in diameter. There propellers give one an unexpectedly delicate impression. Note how at the central tips there are points to engage with the engine starter truck. If you close your eyes, you can clearly envision that starter truck revving up the engines. That is the true pleasure of SWS kits. Complete replication of the wide variety of weapons equipped to the Dragon Slayer "Toryu"
With a wide variety of weapons equipped at the nose, lower fuselage, rear seat, upper fuselage and more, the kit includes details such as the mounting method, reloading, and ejection. Learning as you build is one of the greatest values of an SWS kit. The Toryu earned its name as the "Drayon Slayer" with its Ho-203 cannon mounted to the nose, its most distinctive armament and one of the leading stars of intercepting B-29s. The Zoukei-Mura team fully utilized the few remaining documents about the cannon in order to faithfully replicate the unique mounting method connecting to the fuselage bulkheads and cockpit floor. The mounting method, reloading, and ejection of the Ho-5 upward-firing cannon is based on the information collected by the Zoukei-Mura team in their thorough research of the sole remaining actual aircraft at the Smithsonian National Air and Space Museum. This kit replicates the late version of the Tei type or the Hei/Tei Tai-Atari version. As a result, the Ho-3 cannon on the fuselage underside and the Type 98 rear machine gun are omitted. We hope that you will gain a full appreciation for the differences between the versions as you build the kit. The Toryu is engineered in a truly Japanese-style construction, with many bulkheads and crossbeams. The wings utilize an uncommon truss shape, with the center, left, and right wings separated into three parts. Longerons in each of the four corners intersecting the fuselage were designed to strengthen the entire aircraft. It seems that the actual aircraft was built starting with the fuselage and the central wing part, and then the outer wings were attached to either side. However, for the SWS kit, the wings are assembled as one part to facilitate the building process. Also, be sure to note the unique framing methods used for the area around the main landing gear. The wheel struts featured a hydraulic system for retracting the wheels directly backwards into the nacelles. When retracted, the struts' axis of rotation was not aligned with the dihedral angle, but parallel with the ground. At first glance the parts around these landing gears appear mysterious and complex, but the true value of SWS kits is in the details that have been designed with serious consideration to the angles and strength of every part. Please enjoy every detail that we have included in this kit. 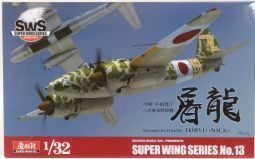 Check Out These Highlights of the SWS 1/32 Toryu Ki-45 Kai Tei Long Nose Late Version! 1 The Toryu was a twin-engine fighter aircraft designed and developed by Kawasaki Aircraft Industries for the Imperial Japanese Army. The Ki-45 proved to be particularly capable of intercepting large aircraft, playing a major role in the defense of the mainland up until the very end of the war. With this kit, you can replicate the Tei version from those final days of the war or the Hei/Tei Tai-Atari Special Attack version. 2 While its external appearance may seem simple at first glance, every part of the airframe is actually engineered in a highly complex and interconnected fashion. In particular, the nose, canopy area, upper and lower fuselage and the curving construction of the front and rear fuselage is very impressive. The SWS kit faithfully replicates each and every one those qualities.